The need for climate controlled storage was highlighted in a previous blog from July here at the Boxpert Blog. We highlighted a mobile IT unit that was built to maintain the temperature of sensitive electronic and computer The South Texas Nuclear Operating Power Plant has since contacted us. They needed a 20 foot shipping container modified to include insulation and a cooling unit was ordered to store sensitive materials, and we were happy to help. The nuclear power plant required a consistently regulated temperature controlled environment. 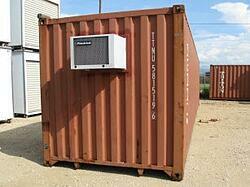 Let’s summarize the benefits to using a modified repurposed shipping container as the storage solution. Convenience - These 20 or 40 foot containers are easily delivered to your business’ location and can be stacked if needed. Only a flat surface is required for stability. They can serve as temporary storage and are completely mobile if your location changes. Temperature and Humidity Control - The ability to regulate the interior temperature of the container is facilitated through an A/C unit. Despite the exterior temperature, a consistent regulated interior environment can be maintained through the installation of insulation and a climate controlled cooling unit. Structural Integrity - A repurposed shipping container is built with high grade reinforced steel and provides a completely wind and water tight environment. Once modified to include the cooling unit and proper insulation, these 20 and 40 foot containers become a useful temporary or permanent structure to protect items sensitive to the environment. The use of a repurposed shipping container or conex box when a consistent regulated temperature is required for your sensitive items may be the convenient, secure, temperature controlled environment you are looking for.